Throwback Thursday " Vintage Valentine's Day Ad"
With Valentine's Day this weekend, I thought this ad was pretty fun to show you today! 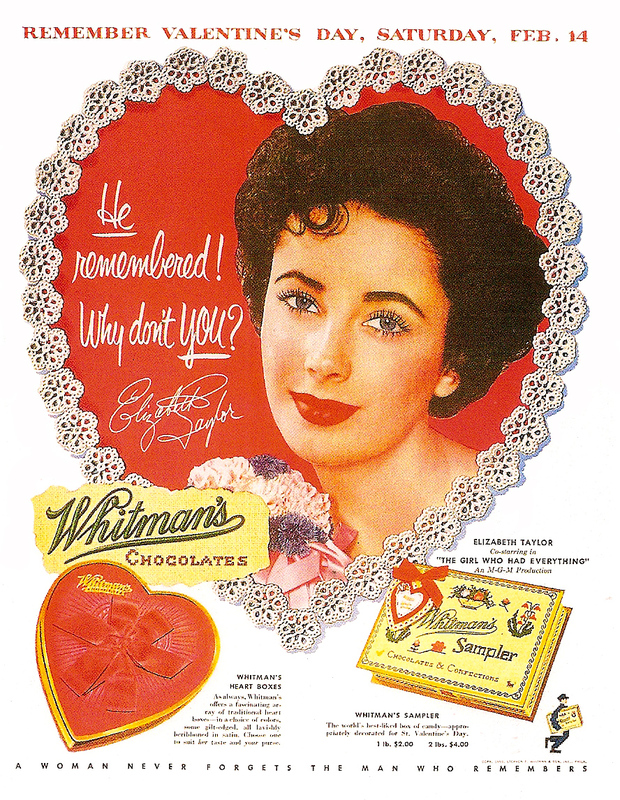 Elizabeth Taylor was just so beautiful, I never knew she did an ad for Whitman's Chocolate! This was one of my Dad's favorite candies, until I started bringing him some gourmet choices from NYC. He always was a fan however, and they have a rich history. I like the idea that a pound of chocolate can cost you $2.00 ! What a bargain! In 1842, a 19-year-old Quaker named Stephen F. Whitman set up a small "confectionery and fruiterer shoppe" on Market Street near the Philadelphia waterfront. His shop attracted Philadelphians from all walks of life, leading citizens to sailors. Thanks to exotic ingredients taken to Whitman by well-traveled sailors, his candies quickly gained renown across the Northeast. Whitman was an innovative marketer; he knew that presentation could be as important as taste to some customers. So he created beautiful packaging and well-crafted advertising campaigns that focused prospective customers on the quality of his candies. Whitman's became a familiar name, thanks to ads in newspapers and magazines as early as 1857.
Business thrived, and the company's facility in Philadelphia expanded. New products, including tinned Instantaneous Chocolate, brought acclaim and boosted profits. In 1869, the next generation took the reins when Horace Whitman replaced his father as company president. Horace introduced America to cellophane, a then-wondrous material that helped keep candy fresh, colorful and clean. By 1907, Whitman's Candies were appearing on the shelves in "better drug stores" across the region. Four years later, Walter Sharp stepped in as president; he developed new products and initiated the company's money-back guarantee that continues to this day. Sharp also created the Whitman's Sampler®, an assortment of the company's best-selling chocolates. Inspired by a cross-stitched sampler hanging in his home, Sharp worked with a skilled employee to create the sampler that's reproduced on Sampler boxes to this day. By 1915, the Sampler had become America's best-selling box of chocolates, a position it still holds today. The company has a long history of honoring servicemen and women. During World War I, the company began distributing chocolates to soldiers, another noble tradition the company continues today. Whitman's Candies survived the Great Depression without sacrificing quality, lowering prices, or reducing dealer profits. In fact, more magazine ads were run in the 1930s, at the height of the Depression, than at any other time in the company's history. Products and packaging evolved ... new products were added ... and the company continued to prosper. With the start of World War II, the company introduced the beautiful Land, Sea and Air Tins. Women working the candy lines added handwritten notes to packages sent to soldiers; some of those notes results in long-term friendships and in a few cases, marriage. Refrigerated display cases in 1946 enabled dealers to store fresh candy longer. After WWII, Hollywood's brightest stars promoted Whitman's Candies, often in exchange for payment in chocolate and a mention of the star's latest movie. As America became more health-conscious, the company introduced Light Chocolates in 1984, Sugar Free candies in 2001, and the Net Carb line in 2003. In 2005, Whitman's partnered with Weight Watchers International® to produce a line of Weight Watchers Chocolates. Consumers continue to recognize Whitman's as one of a handful of brands that have stood the test of time, a true sampler of American ideals and values. It is fitting, then, that American presidents offer Whitman's Samplers to guests at the White House and those traveling on Air Force One. Have you ever tasted Whitman's Chocolate? Was it a hit for you or no?